IS THE SALES FUNNEL RUINING YOUR CONVERSION RATE? We all know about the tried and true trusted sales funnel and how it helps to weed out unqualified leads so your sales team can focus on qualified leads and increase productivity. The trusted sales funnel allows you to source leads and then nurture them to ensure that as many as possible convert into clients. The basics of the sales funnel are always the same. Acquire as many leads as possible during the ‘awareness stage,’ push them through the funnel, and gradually you are left with those that are ready to convert into sales. Makes sense right? But could the sales funnel secretly be ruining your conversion rate? Like many others, you’re probably looking at your sales funnel in the wrong way. If you believe that your sales funnel is a one-way event and you’re willing to shed leads through the process, then you’re causing serious damage to your sales conversion rate. The way sales happens today has changed and you need to update the way you commit to the sales funnel. There are a vast number of avenues from which a person can actively begin their journey with your brand. Some begin at the very beginning of the sales funnel with no knowledge of you, your brand or your product, and will enter the sales funnel during the awareness stage. Then there are those that will come into the sales funnel with prior knowledge of the product and what they believe they want, or need from you. This projects these consumers straight into the middle of the sales funnel, thus ensuring they miss out on the content that you have prepared for the first stage of the sales funnel. Why Is Missing A Stage In The Sales Funnel So Dramatic? You are looking to book a family holiday, you want a family holiday that will give you the perfect balance of family time and a little freedom from the kids. Along comes your friend who tells you of a place that her friend’s brother went to with his family the year before and you decide to check it out. In this example you’ve been given a recommendation and will immediately jump into the sales funnel, skipping right past the awareness and the discovery stages, since you’ve already sourced the company and what you want from it, and you have landed directly in the consideration stage. Due to you having skipped the first two stages, many marketers will wrongly assume that you have some knowledge of the brand. All the first stage content, directed at new leads is completely bypassed. Not only are you missing out on relevant content, but also the engagement events that occur during those stages. It’s the same thing in the B2B SaaS world. Leads that enter the sales cycle during the first two stages of the funnel are actively sourcing out information that is aimed at educating them towards brand recognition and building engagement and a relationship. With social media and mouth-to-mouth recommendations, more and more people jump directly into the middle of a sales funnel only to jump straight back out to consider another brand, all because no relationship has been carefully nurtured and no loyalty has been gained. The sales funnel is not a one-way system. Consumers are no longer sitting ducks waiting to be targeted and sailed down one route, they are actively gathering information from various sources; web, mobile, social and will move back and forth between the different stages rather than following the sales funnel directly. If you are not able to engage fully with a lead then you will be unable to build a fulfilled relationship. The results will affect the customer experience. Customer experience for someone that jumps right into the purchase stage will differ immensely from someone who has followed the sales funnel and become a nurtured lead. Nurtured leads will have had time to build an attachment to a brand which leads to increased retention. The notion of a sales funnel can be interchanged with the customer experience journey. The idea is to build a fully recognizable journey for the customer regardless of where they join you in the sales funnel. You need to craft an action plan for every event that occurs, and turn every actionable event into an engagement, whether it be responding to a social media response that your company was tagged in when the user was recommended your services, or a thank you response to a purchase that will guide the user back to the product for add on services. Your goal is to turn a decision into an engagement. The sales funnel focuses on the final purchase, hence its name, sales! But we as marketers understand, the end purchase is not what makes a successful business, relationships are what drives success. Customer satisfaction and a positive customer experience in today’s world is vital because of the tremendous effect social media and customer reviews have on businesses. If you thought that bad news travelled fast in the 90’s, can you imagine the strength a single word can have now that the world is constantly online? Building the brand experience into a product and into a sale encourages retention and builds value. Although the sales funnel is focused on a final sale, we as marketers should not be separating the sales aspect of a business from the customer retention and engagement. These two separate entities should be endorsed as one. 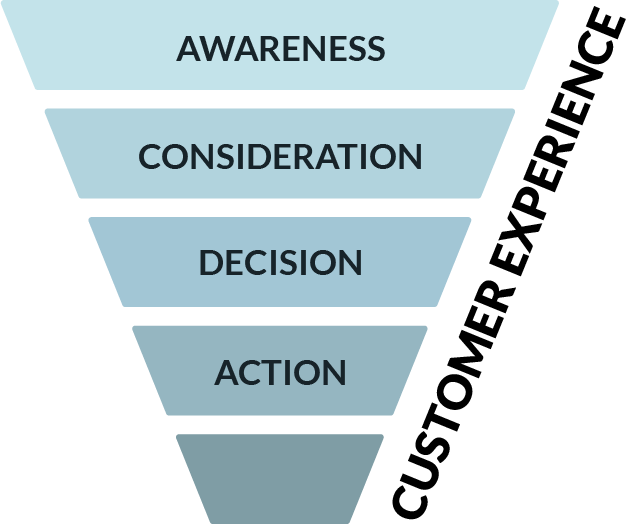 The sales funnel is a great starting point for businesses, but it is not an absolute and should be seen as a flexible journey that encourages a positive customer experience.